(2014/Real Gone) 22 tracks 1976-82. Mit diesen Aufnahmen gewann B. J. Thomas 3 Grammy Awards und einen Preis der Gospel Music Association. Jede der Veröffentlichungen beinhaltet seltene Bonus-Tracks. 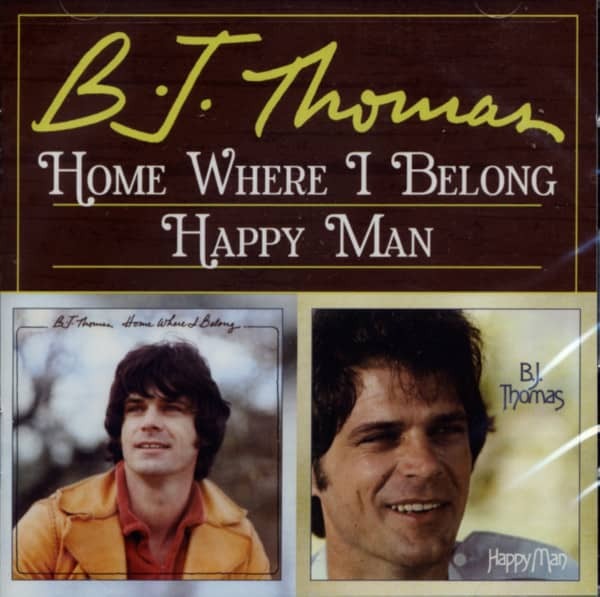 B. J. Thomas is one of the many solo performers to break out of the South of the United States in the mid 60s -like Glen Campbell and Tony Joe White he touched on the country sound, and like Johnny Rivers he used other peoples songs as his hit vehicles. You've heard this voice many times over the airwaves and this collection of songs is realisation of the string of hits and standards that this strong clear singer can call his own. Oklahoma born Billy Joe Thomas had a singing pedigree in the local church choir (like many of his peers) and by the time he was in high school in Texas, he had joined his first band, The Triumphs. Classmate Mark Charron became pivotal in B.J. Thomas' development as a singing star. The pair collaborated on a number of songs when Charron joined The Triumphs as a guitarist, but it would be two of Charron's compositions, 'Billy And Sue' and `Mama', which would prove to be the launching pad for Thomas' career. 'Mama' became a worldwide hit and is still often used as an advertising jingle today, but once again like many of his peers, it took several re-issues on several small labels before the Scepter Records release in 1966 got the show on the road. The Scepter deal came about via friend and fellow musician Steve Tyrell, who had made the shift from artist to record executive, and B.J. Thomas' regional Texas success quickly translated to national fame. Thomas switched his source of material to a young writer and acquaintance called Mark James, who provided him with the instantly recognisable Hooked On A Feeling before going on to write 'Suspicious Minds' for Elvis Presley and 'Always On My Mind' for Willie Nelson. At the pinnacle of his success, Thomas recorded two Burt Bacharach/Hal David compositions, 'Raindrops Keep Fallin' On My Head' and `Everybody's Out Of Town' - the writers continuing their association with Scepter that they started with Dionne Warwick. On paper the pairing of B.J. Thomas and legendary writer Barry Mann in the early 70s looked like another winner, but the reality of a struggling record company stepped in. The single Rock And Roll Lullaby has been acclaimed by some critics as one of the best songs of this era, and most rock scribes note this as the finest B.J. Thomas recording. A homage to the fifteen years of rock and roll which preceeded it, all involved with this project believed they were on a winner, until the release of the single co-incided with the financial end of Scepter Records. Two more hits, `(Iley, Won't You Play) Another Somebody Done Somebody Wrong Song' and `Whatever happened To Old Fashioned Love' followed many years and several labels apart, but the days of single after single hitting the charts were long gone. B.J. Thomas has continued to record up to present day, and it was his voice singing the theme to the TV show Growing Pains. This collection covers all the major Australian hits of B.J. Thomas and include some of his more interesting releases such as his version of the Hank Williams song 'I'm So Lonesome I Could Cry' and one of the first recordings of the Barry Mann/Cynthia Weil standard 'I Just Can't Help Believing', showcasing the rich legacy of B.J. Thomas' voice. Kundenbewertungen für "Home Where I Belong - Happy Man"